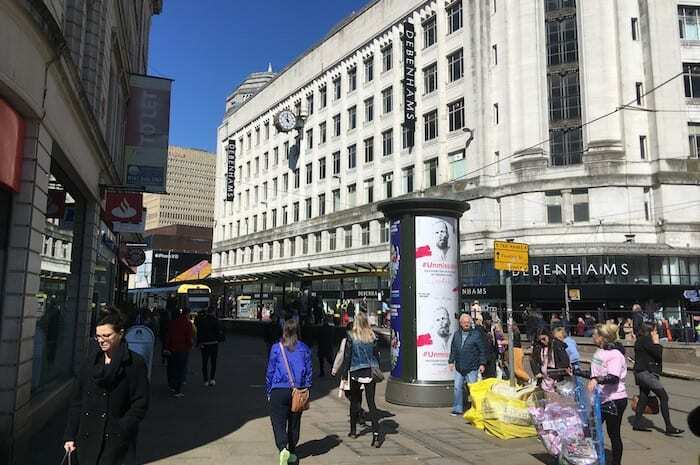 Many avoid eye contact on Manchester's Market Street - but what if you said yes to everything on offer? Manchester’s busiest shopping street. Home to the city’s buskers, hawkers, marketeers and chuggers. It has long been said that walking the bustling pedestrianised thoroughfare in the city is a bit like running the gauntlet. A walk that you’ll survive best by keeping your head down, doggedly refusing to make eye contact with anybody. But what if you did the exact opposite? And just said yes to everyone and everything? That was my challenge on a busy sunny Thursday in Manchester. And this is what happened. Things get off to a pleasant start. 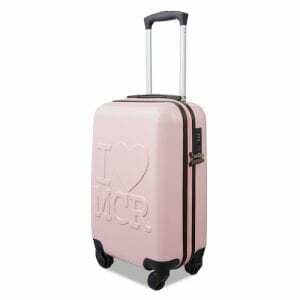 I have barely set foot on Market Street at its top end near Debenhams when a group of young women approach me brandishing what look like cans of fizzy pop, and it’s naturally a yes from me. Even better when I look at said product and it turns out to be a new chilled coffee drink. They gleefully give me two tins of the stuff which go straight into my bag for my office beverages for the day. I must start to look like easy prey because I’m then surrounded by the street distributors for a host of publications. 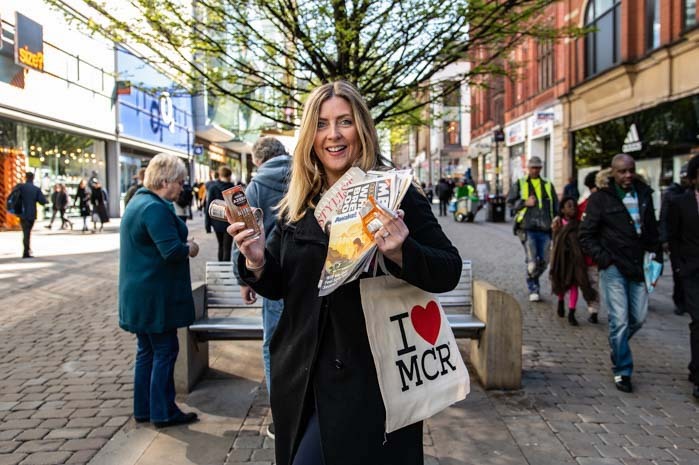 Naturally, I say yes to all – and I’m swiftly laden down with copies of Metro, Manchester Evening News and Stylist. The latter publication also comes with some free vitamin sweeties that will apparently make my hair look nice, which is an added – and some might say quite needed – bonus. 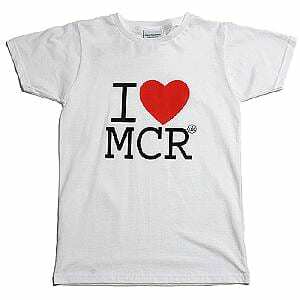 On I walk past Primark and spot a gaggle of sales people smiling eagerly at anyone who will look their way. Normally I adopt a rictus grin and mutter: “sorry in a rush” but today I can’t. Today I’ve got to say yes. Fretting about what they’re proffering, it turns to be one of those energy comparison companies. I’m pretty sure I’m on the cheapest deal but I let the very nice sales woman talk me through it all. When I tell her I’ve got to say yes to everything for this feature she looks like she might well explode with excitement. Let’s just hope I really am going to be £6 a month better off after this. Dashing over the pedestrian crossing, I wonder whether I’m supposed to follow a man with an arrow pointing to Pizza Hut as part of this experiment, but decide I should probably stick to the main Market Street drag. It’s lunchtime and it’s getting hectic. A man with a stall filled with caps, scarfs and mobile phone cases asks if I’d like anything, to which I reply: “yes”. Hoping to not end up too out of pocket, I ask what would be the cheapest. 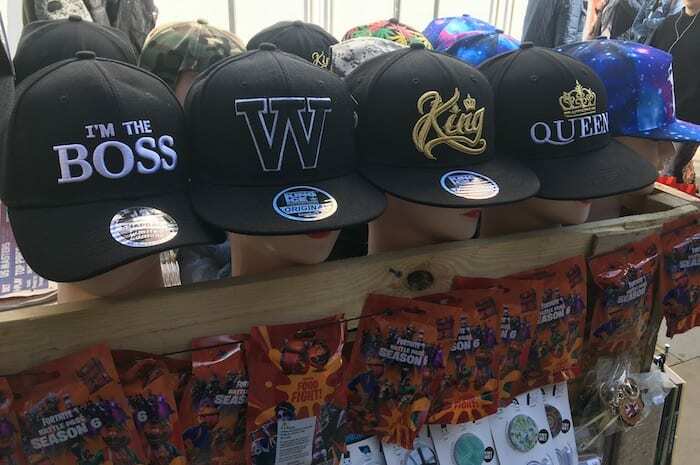 It’s a hat with “I’m the Boss” stitched on it which I manage to haggle down to £8. I’m not convinced it’s bargain of the century. A guitarist is sitting strumming out a Cliff Richard and the Shadows classic with an obedient pooch at his side, and I pop over to drop a £1 in his hat. He has a sign next to him saying: “Don’t feed the dog” so I don’t. Further along I happen across some artworks on the ground with a sign saying: “Starving artist – all contributions welcome”, and so I duly contribute. I get chatting to the starving artist in question – Brian – who it turns out is a bit of a Market Street celebrity. He used to be known for playing his trumpet, but is now concentrating on his poetry and art. It turns out times are tough on Market Street. 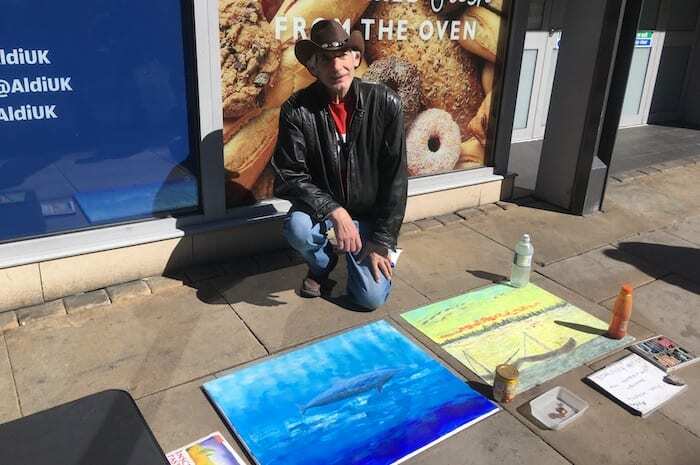 People just aren’t all that willing to part with their cash anymore, and some ignoramus even trod on his canvas painting of a shark this week. Meanwhile, a crowd is drawing around a very boisterous female singer in the centre of the street, who is performing Pharrell Williams’ Happy. Incredibly, people are so impressed they all start dancing along with her. She looks at me and sings the lines: “Clap along, if you feel like happiness is the truth”. I duly concur and start clapping along. This makes me happy. Heading towards the foot of Market Street I pass signs saying: “You are invited”. Ever keen for an invite to anything, I stop for a chat with a delightful man named David. 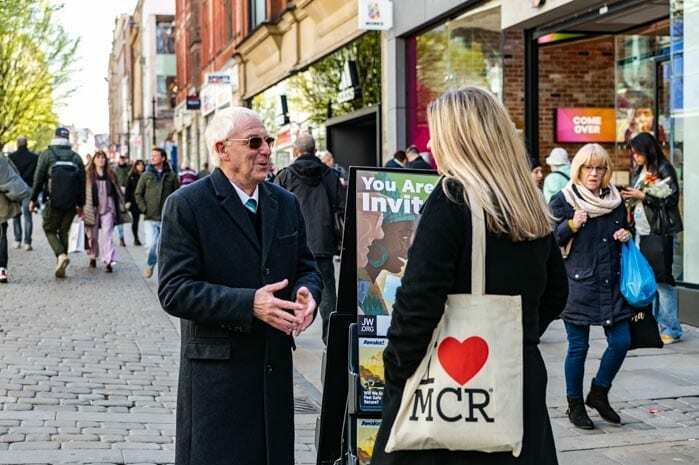 He is one of the 30-strong team of Jehovah’s Witnesses who can regularly be found bringing their religious message to the people of Manchester. He says they don’t force their message on people, and wait for people to approach them for a chat. “Most people are nice and respectful,” he says. Glad to hear it. Clearly sometimes it pays to look up from your mobile phone and actually engage with what’s going around you. Yes, even on Market Street. 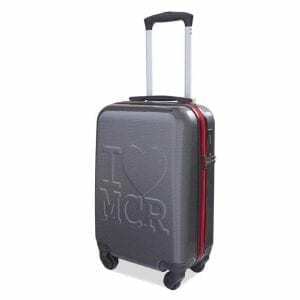 The street is becoming a national marketing teams’ dream for testing out new products with such a high footfall of people that you can undoubtedly come away with some decent freebies if you keep your eyes and ears open. I was worried I’d end up setting up direct debits left right and centre with those chuggers – but not one was to be seen on my stroll. And it was actually really lovely to have a chat with people, rather than simply hurrying past in a rush. Why not try it? Heck, you might even get to have a dance.